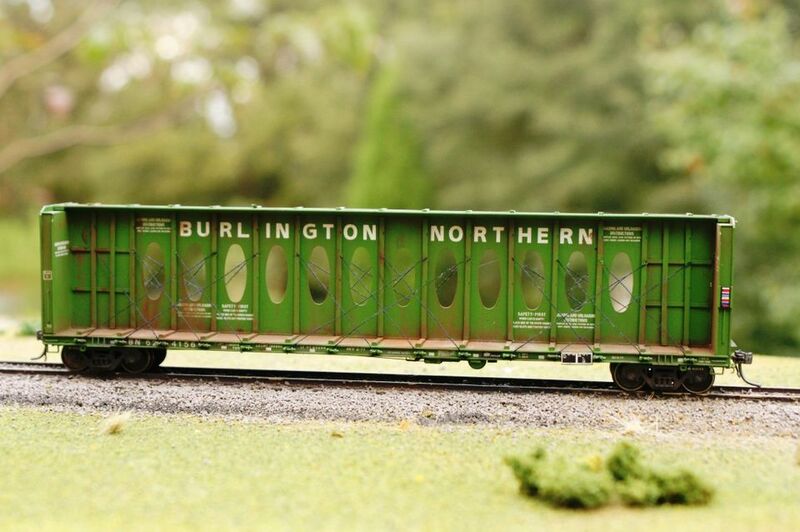 There are many ways to make your model trains look old and well-traveled, but none is more reversible than chalk. If you've never tried weathering before, this total reversibility should give you the confidence to start. Weathering chalks are available in a variety of colors from model companies or at art supply and craft stores. You can buy chalk as sticks or powder. Sticks are usually cheaper, and you can turn them into powder easily with a small piece of light sand paper. Earth, rust, and grey tones all work well for simulating the dust, rust, grime, and grit of railroading. Study pictures of the prototype for inspiration. Clean the car with a soft cloth to remove any fingerprints before you start, or your model will end up looking like evidence in a detective drama. You can also wash models with mild detergent to remove heavier coats of dust and oils. Cheap plastic gloves are handy for keeping the oils in your hands off the car while you work. Chalks generally adhere best to a flat finished surface. If your model has a high gloss, use a flat finish spray to lessen the shine first. Mask off windows before applying the clear finish. There are several weathering techniques that will yield different results. Combine these techniques to produce endless combinations of effects and mix it up to make each car unique. Most cars are not equally weathered from top to bottom, but you can create the look of faded paint with a total wash. Choose a shade of chalk similar but slightly lighter in color than the car. Apply the powder liberally over all sides, roof, and ends with a soft brush for an even coverage. Don’t worry about avoiding printed lettering or details, the total coverage will make these look thinned as well. Add additional colors on top to simulate other weathering effects. To simulate dirt kicked up by wheels or soot and dust deposits on roofs, sprinkle powders along the trucks, bottom, or top edges of the cars respectively and work them in with a soft brush. Use brush strokes that mimic the natural effects, swirling upward strokes at the bottom, vertical streaks from the top down above. Rust tends to be more localized in nature, collecting around rivets, seams, scratches, and gouges. Use a smaller stiff brush, or apply color directly from the chalk stick. Using a variety of deep brown and orange colors can create interesting effects of old and new rust. Use a stiff brush to drag rust streaks vertically down the sides of the car from the initial application. Removing weathering applied with chalks is easy. If you don’t like the results, simply wipe off the car with a damp cloth. When the car dries, try again. Reverse weathering can also be used on purpose to dramatic effect. Clean and dirty sposts show signs of maintenance and repair. Sides of locomotives often have “clean streaks” where employee’s bodies rub off road grime as they walk the narrow walkways. This can be easily recreated by chalking the carbody and then carefully removing the chalk with a small sponge or tissue. Unfortunately, because it is so easy to remove, the biggest challenge to using chalks can be keeping them on. Once applied, you will need to be very careful when handling the car or you’ll leave fingerprints, and you can’t simply add more chalk to make them disappear. The best way to seal the weathering is to apply another light coat of flat finish. However, you can’t spray the finish directly on the car without washing off the chalk. Spray the flat coat well above the surface and allow it to settle on the car as an almost-dry mist. Use repeated light coats. Plan ahead and apply chalks a little heavier than you want for the final results, as some will almost certainly wash off despite your best efforts. For other methods, try airbrushing or drybrushing.